This is a show Hunter that has just finished a long show season. He has come into my life for a little light training and to let mind, body and feet have a much needed break. 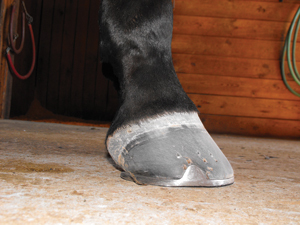 The life of a show horse being what it is, the farriers that work on them during the show season really have their hands full keeping these horses showing and sound. The fact that the horses have limited turnout, two to three baths a day and a variety of footing to deal with makes keeping them sound a tough job. 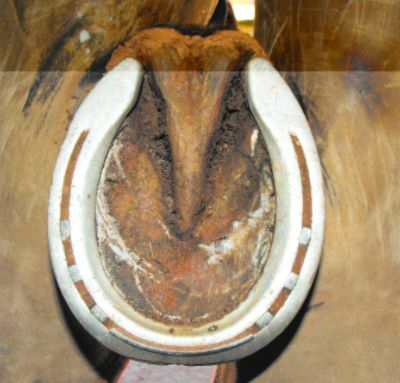 My hat is off to these farriers. I was very fortunate on this day to have my good friend, Patrick Bone, to help me. Patrick and I have been working together a long time and I consider it a privilege to have him work with me on any horse. Normally we would be in a hurry to get done so we could take the rest of the day to go fishing, but the boat was in the shop for repair. So we pulled out the camera, put on our aprons and dove in. 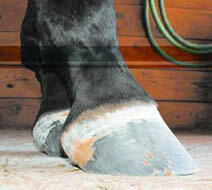 The first thing we looked at is the overall conformation of the horse and how he is shod. 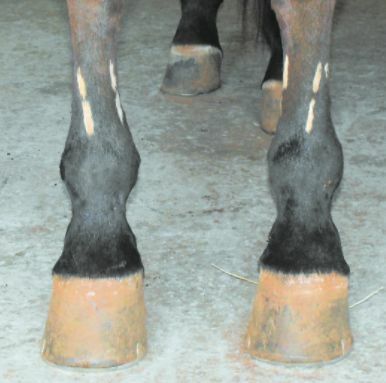 He is not the straightest legged horse we had ever seen, but we both have seen worse. You can also see where he has been nerved in the past. 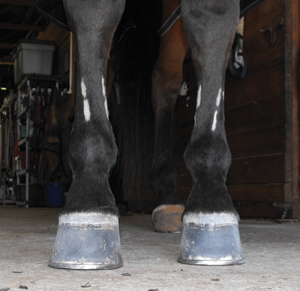 He was shod just as you would expect, a little extra foot and a hunter fit (spot on). Since we had the luxury of a break from show biz we could think in terms of more support and gathering up the feet. 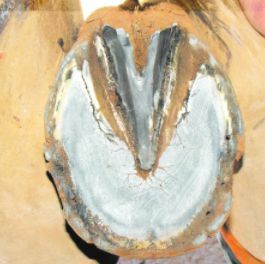 We just want to make sure that we put the foot in the center of the leg and the foot and leg in the center of the shoe. 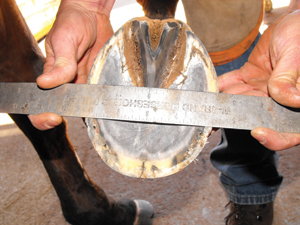 Images 1, 2, & 3: Various views prior to shoeing, notice signs of nerving procedure in image to far left. 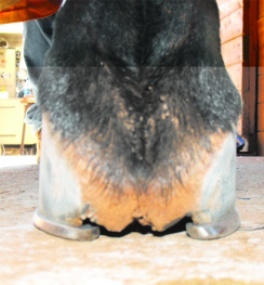 The front feet were shod in aluminum as all hunters are and fit spot on. A very safe job. After removing the shoes and removing the dead sole we trim the frog removing any dirt traps and finding the true apex of the frog (where the frog meets the live sole). We now use the trimmed frog as the foundation to start our trim. My goal is to have the widest part of the foot parallel with each other approximately 1/2” to 3/8” behind the true apex of the frog after the trim. Also, I want to be as equal as possible medially and laterally across this same point (widest part of the foot). The heels should be equal length and back as close to the highest and widest part of the frog as I can get. The main thing that I keep in mind is that these are goals and I do not want to over prep the feet to achieve them. 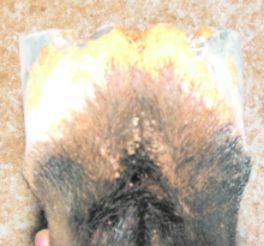 After I have trimmed the feet as close to this protocol as I can, I will use the shoe choice and placement to compensate for any deviations that I come across. For this horse we decided to go to steel to give a more stable base of support since we are fitting with a little more length and width. 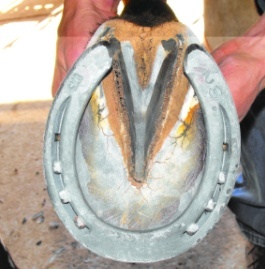 To compensate for having more foot medially or laterally, I fit the shoe as if both halves are equal and box and safe the shoe on the narrow side. This is not always possible due to environment or job, but you can generally give a little help. To address anterior/posterior deviations I start at the widest part of the foot again. I want to have equal amount of foot in front of and behind this point. I’m not a big proponent of totally unloading the toe wall of the foot. I generally set my shoes back a little, but I want the toe wall bearing and supporting weight. 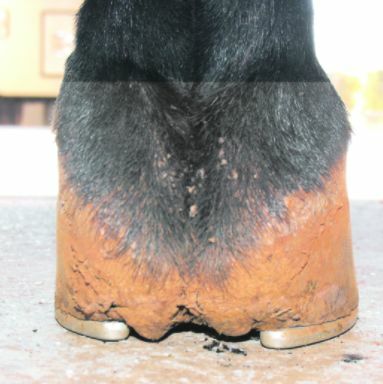 As you can see on these feet the white line appears stretched or stressed. By using the widest part of a properly trimmed foot as a landmark, I do not have to guess where to put my toe, it gives me a destination. Once again these are goals that I’m trying to achieve, not hard and fast rules. By having a set foundation to work from, I’m better able to see the successes or failures of my work.